In the Band 5 Optimization for HSN, we looked for high ROMI special situations in the database. This is really classic database marketing stuff, you’re looking for segments, and you’re looking for ways to Optimize those segments. You could spend the rest of a career doing this kind of thing; there are always new segments like FIPS being revealed if you have an active analytical staff. There were other programs in Band 5 based primarily on product-related transition phases in the LifeCycle; I won’t go into these here. If you are interested in these ideas, I wrote one detailed example, which combines Customer Experience Management / Band 3 – Customer Comment Analysis / Math / Product / Marketing right here. Bands 6 – 8 are basically about making the most of a known dis-Engaging situation; the customer has passed Peak Engagement and not responded to any Individualized Marketing. If we don’t get the customer to activate in Band 5, they’re not coming back to TV in this Lifecycle. So in Bands 6 – 8, you’re trying to make the best of the dis-Engaging situation (see Band model). Mail order buyers from the Magazine end up here in Band 6 as a “catalog only” customer, where a different set of models (no TV) takes over. Failing success in Band 6, and recognizing some purchase affinity with certain categories, we might try a specialty catalog as the customer slips into Band 7, or try to cross you over into being a Travel Club (HSN’s captive travel agency) customer. Failure in Band 7 essentially means Marketing is out of bullets. There was no program we could offer you, of any kind, that would create a profitable two-way relationship. The customer then slides into Band 8. For a time, the catalog folks were doing some list rentals with Band 8 customers, but we terminated that based on the results of controlled testing – the net income from rentals could not offset the cannibalization of what little sales were left from the Band 8 group. I believe the annual sales across all channels in Band 8 was something like 30 cents per customer. Not that you want to toss that revenue out the window, but that’s not my point. The point is this revenue happens all by itself in an Interactive environment, and Marketing can’t do anything to increase it. Therefore, anything you spend trying to affect this revenue is simply a waste of time and effort, and actually may ultimately undermine this revenue by “pestering” the customer. As you can see if you’ve read this whole series, each Marketing Band has a clear goal, and is Optimized for this job. As customers drop down through the Bands (the Customer LifeCycle), they are exposed to new Optimization scenarios based on their current relationship with HSN – where specifically they are in the LifeCycle. 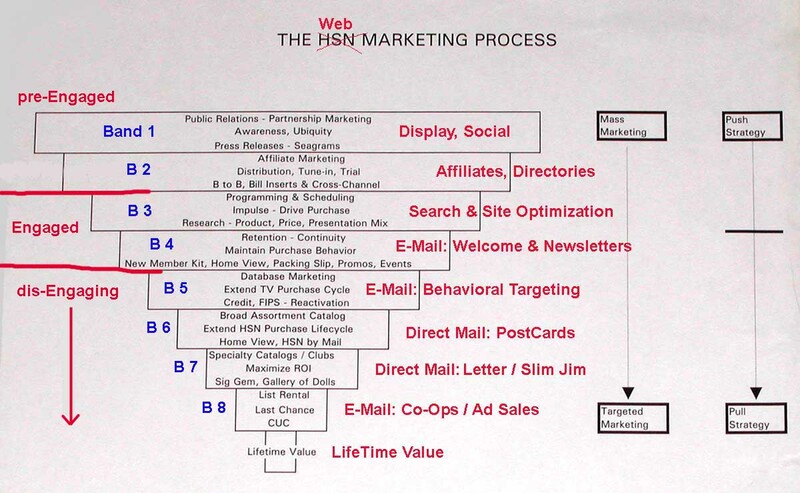 There was a deliberate sequencing of Marketing contact following the AIDAS model. Once the customer has transacted for the first time, we switch from Push to Pull Marketing, with the idea that incremental customer value could be created based on understanding Behavior. Customers may be in cycling back and forth between Bands 4 or 5 for months or years; this is self-determined based on their behavior. Once the customer dis-Engages from the Primary or Initial channel into Band 6, there may be some options if your company has other channels or divisions, but the primary LifeCycle is over. If cross-sell doesn’t get a reaction in Bands 7 and 8, we just let the customer go, from a Marketing spend perspective. We have stopped marketing to you completely. No “unsubscribe” needed. We know you’re through with us, you have said this much very, very clearly through your (lack of) actions. And we don’t want to damage our Brand by pounding you with irrelevant communications. So we’re just going to stop trying. There’s no money in it for us, and you have clearly moved on with your life. Further, we will stop Marketing to you because we know through our social cluster studies you will probably tell your friends or co-workers (face to face, not through a social network, this was the mid-90’s remember) that even though we are not for you anymore, your experience was very positive. We don’t want to damage the Potential Value of you sharing your positive experiences with others by shouting at you. And we welcome the other folks in your social cluster should they want to participate. Thanks very much for the Relationship, we have enjoyed it, and hope you have too! We understand that something in your life has changed. If you’d like to come back for another LifeCycle trip down through the Marketing Bands, we’d love to Engage with you again.